There are plenty of options out there when it comes to booking a Melbourne wedding band for your big day. Maybe your wedding is going to be big, hundreds of guests, a spectacular venue with no expenses spared. You want the music to match the grandeur so you decide to book a large ten-piece super group. Alternatively, maybe your wedding is far more low-key, held at a small venue on a Sunday afternoon for example. So, you feel a duo simply playing acoustic guitars and singing some mellow tunes would be far more appropriate. But what if neither of those options suit your needs? What if you are looking for something in between, or perhaps you’re looking for elements of both! If that’s you then the “Acoustic & Electric Duo Wedding Band” may just be the option you’re after. What exactly is the “Acoustic & Electric Duo with Backing Tracks”? In short, the Brightside Acoustic & Electric duo is both an acoustic duo AND a full 4-5 piece rock band all in one! But wait, I hear you ask, how can a ‘duo’ be an entire band?? Well that’s where the backing tracks come in. Backing tracks are essentially pre-recorded instruments (such as drums, bass guitar, keyboards, horns etc) that we play along with. Our own vocals and guitars are live but the rest of the ‘band’ lives inside our iPad. The combined sound is of such high and professional quality that if you were to close your eyes you would swear that you were listening to an entire live band. What makes your backing tracks so good? Other solo/duos/groups often buy pre-made backing tracks from websites that sell them for a few dollars each. Some of these can sound okay, but a lot of them have a tinny “karaoke bar” sound. 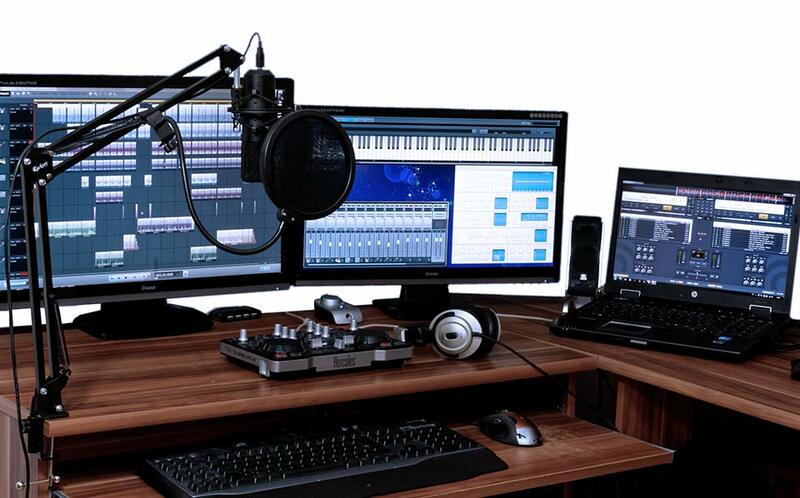 Our approach is totally different – we make every backing track from scratch ourselves. Fortunately, we both have a couple of decades of composing and audio production experience. Our experience combined with state-of-the-art recording software and equipment ensure every backing track is crafted to sound its absolute best. It really is nearly impossible to tell the difference between our tracks and a live rhythm section. So, if it sounds just like a real band then why not just hire a real band? Price: Simply put, hiring 2 people instead of 4+ is going to be cheaper. And it’s not just the number of people you are paying for either. A large band usually requires more equipment, which in turn means they will need more time to set up and pack up. All of this gets factored into the overall fee. Space: Following on from the previous point regarding equipment, A duo requires less gear than a full band. There are no drums, no keyboards, fewer microphones, fewer fold back speakers, fewer cables etc. So, if the venue you booked is a little short on space then there is a much better chance the duo will be able to fit. Volume: When half the band lives inside the iPad it is much easier to control volume. Big bands can be very loud with little room to move when it comes to noise. With the Acoustic & Electric Duo we can go from background music volume to stadium concert volume and everything in between. It can be easily adjusted to suit your needs. That all sounds great but where does the “acoustic duo” fit into all of this? The beauty of the Acoustic and Electric Duo is we are able to offer a dynamic variety of music throughout the reception. Generally during the first half or so of the evening people are mingling and chatting as well as eating their meals. Throughout this period, it’s not appropriate to blast out dance floor party anthems so we tend to start of with a couple of sets as an acoustic duo. Just acoustic guitars and vocals. It sets up a great atmosphere, with great music without being too overpowering allowing everyone to enjoy each other’s company. Once the formalities are over though (and usually after everyone has had a drink or two) it’s party time. That’s when we replace the acoustic guitars with electric ones, put on the backing tracks and turn up the volume! The Acoustic & Electric Duo with Backing Tracks can be a great option for your wedding band if you are looking for a variety of music ranging from mellow to dance floor fillers. Pricing is very competitive, and you have far less to worry about if your venue is on the smaller side. 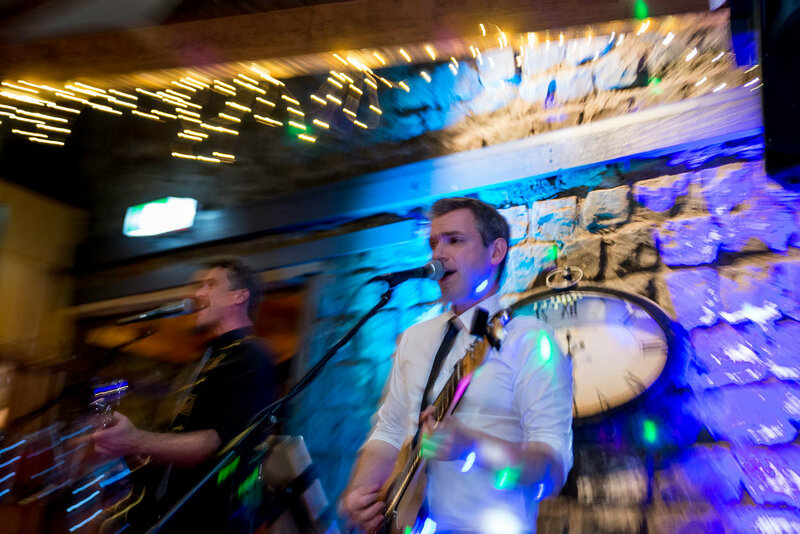 In many ways the Acoustic & Electric Duo Wedding Band can offer you as much if not more than a regular acoustic duo and regular full band combined! We hope you have enjoyed this post. Please get in touch with us if you would like to know more! Mick was so easy to work with and we're so happy we found Brightside Duo for our wedding last week! The organisation and communication was timely, easy and stress free. The music was fun and got everyone up on the dance floor, which was exactly what we wanted. Even my 92 year old nanna had a spin. On the night, Mick also took on the role of MC so naturally, despite not meeting him until part way into the reception, with just the right amount of gags and good humour to lighten then mood. If you're after a smooth, stress free and fun event, these guys are great! Thanks Mick! We had the Brightside Duo perform and MC at our wedding and it was amazing, we could not have picked a better group. Very professional and had everyone up and dancing all night. We highly recommend them and would fit any occasion. Great work guys!!! Brightside Duo recently were the band at my wedding. They were perfect! They played great songs, got everyone moving and set a great vibe to the night! They were fantastic to work with and worked with our timings and suggestions. Prior to the night they were great at communicating and gave us tips that we used on the night as well. You wont regret working with Brightside Duo! These guys are absolutely amazing. Very well received at our reception, everything was executed perfectly. Dan and Micks ability to set the mood and their professionalism at MC-ing is second to none. Highly recommended for any event! Thanks again Dan and Mick. The Brightside guys were an absolute hit at our reception! Everyone raved about their wonderful musical ability and also their willingness to engage with the guests. I would highly recommend these two for any event that deserves a touch of live music - you can’t beat it!